Wouldn't it be nice if you could get set screws with a unique keyway that wasn't sold retail, so you were the only one who had the ability to turn the screws? That would be a great solution for applications like retail product displays of high-value items or military weaponry cases. Good news: the Key-Rex® set screw does exactly that. 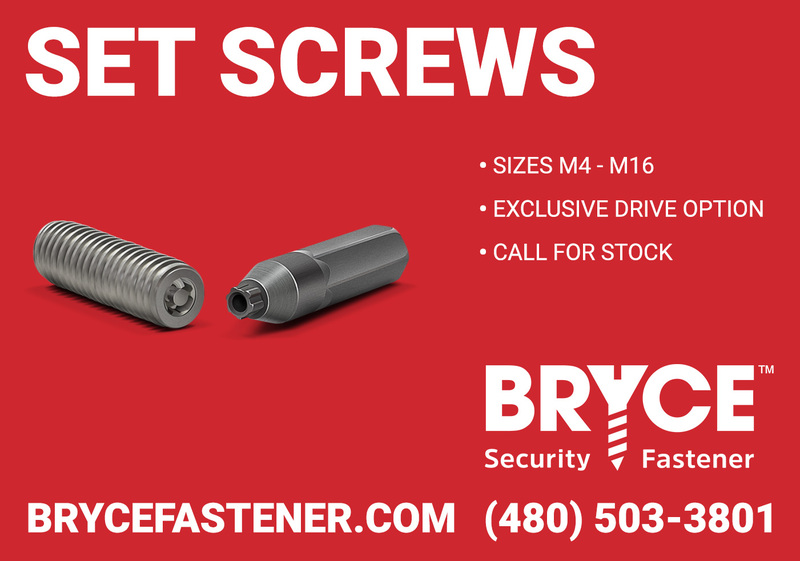 Every Key-Rex® screw is custom "keyed" for a individual customer, and that customer is the only one who has the bit to fit their custom screws. Other keyway options are available, like STYKFIT®7 and Penta-Plus™, with drives that are exclusive to Bryce customers. We also make set screws with standard security drives like Tam 6-Lobe™ and Hex Pin, but we only recommend those drives for securing items under $100 in value, because the bit tips are available for retail purchase. Sizes range from 8/32 (M4) – 5/8-11 (M16), and the length must exceed the diameter.